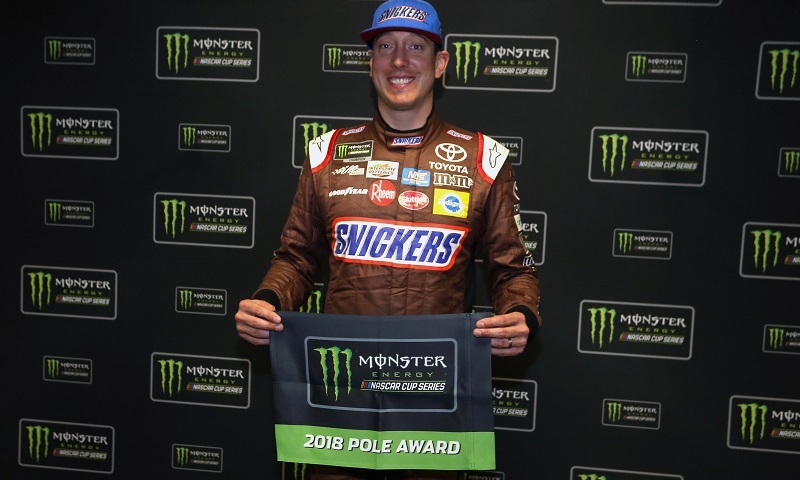 HAMPTON, Ga. — Kyle Busch has accomplished a lot of things in his NASCAR career, but he had never managed to top pole qualifying at Atlanta Motor Speedway in 19 prior tries. That changed Friday evening, as Busch rocketed to his 28th career Monster Energy NASCAR Cup Series pole and first at Atlanta during knockout qualifying at the 1.5-mile quad-oval. Busch took the No. 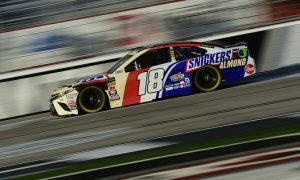 18 Snickers Almond Toyota to a fast lap of 30.024 seconds (184.652 mph) in the third and final knockout round, avenging a near-miss from two years prior when he posted the fastest lap in time trials and then had his time disallowed in post-qualifying inspection. There were no issues this time around, though Busch admitted he was battling some handling issues before nailing it in when it mattered most. While Busch was celebrating on pit road, the late Buddy Baker was surely celebrating from afar, as Busch’s lap bumped Ryan Newman off the pole late in the final round of qualifying. Newman was going for a record eighth Cup pole at Atlanta, which would have broken a tie with Baker, but came up .038 of a second short in his No. 31 Liberty National Chevrolet and will start second (30.062/184.419) in Sunday’s Folds of Honor QuikTrip 500. Kevin Harvick was third-fastest in the No. 4 Jimmy John’s Ford, giving all three manufacturers representation in the top three on the starting grid, with Daniel Suarez and defending race winner Brad Keselowski completing the top five. Practice leader Ricky Stenhouse Jr. was sixth overall, with Kurt Busch, Kyle Larson, Clint Bowyer, Erik Jones, Aric Almirola and Denny Hamlin completing the dozen drivers who advanced through all three knockout rounds. Jamie McMurray was the first driver who failed to make the final round of qualifying, lining up 13th on the grid after a lap of 30.324 seconds (182.825 mph) in the second round with his No. 1 McDonald’s Chevrolet. Other notables starting in the midfield include Joey Logano (16th), Alex Bowman (18th), Daytona 500 runner-up Darrell Wallace Jr. (19th) and seven-time series champion Jimmie Johnson (22nd). Daytona 500 champion Austin Dillon never made it out of round one on Friday and will start 25th (30.503/181.753) in the No. 3 Dow Chevrolet. Meanwhile, defending Cup Series titlist Martin Truex Jr. will start from the last row of the grid after his No. 78 Bass Pro Shops Toyota failed pre-qualifying inspection three times, with the car never even making it to pit road to attempt a qualifying lap. As a result of the inspection failures, car chief Blake Harris was ejected from the track for the weekend, and Truex will also lose 30 minutes of practice time on Saturday as well.